This project is part of the Municipality of Rome’s initiative to redevelop a number of transport depots within the city in conjunction with local public transport authority ATAC. It involves the regeneration of a neighborhood with a weak identity but with good growth potential due to its location at the edge of the city centre. Labics’ aim therefore was to create a new centre for the local community, but also to increase its profile as a place of transition with privileged access to the city centre. The development of the site has been designed to be porous, allowing good access to and from the site, encouraging the flow of people and demonstrating Labics’ philosophy that cities should be built around systems rather than as a series of objects. Public realm space is not seen as residual but is fully integrated with the built elements – so, for example, the basement space becomes the load-bearing structure for high level walkways as well as a pathway in itself. This creates a complex public space, rich in experience. The project is articulated over different levels, with commercial activities and the public library at ground level, offices on the first floor and public spaces on top of those. Three buildings are suspended above this public area – one containing more offices and the other two for residential use. The residential buildings contrast in terms of their typology and external treatment. 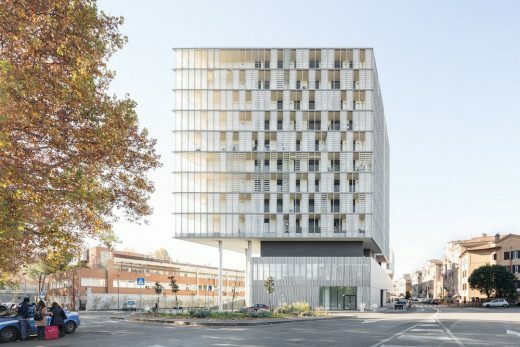 The first is a tower containing small and medium-sized flats, partially enclosed with a horizontal glass brise soleil. The second ‘villa’ building contains luxury duplex apartments and is clad with aluminum panels that provide flexible, adjustable sun shading and a playful, everchanging envelope. 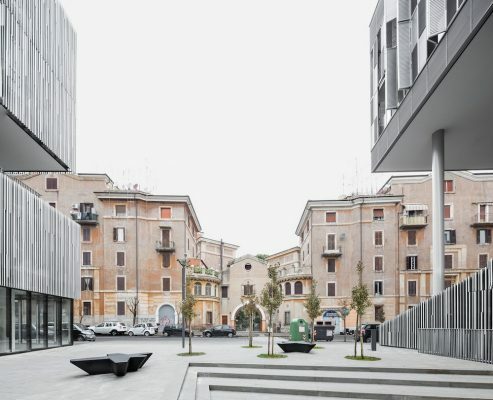 After the success obtained with the maSt project in Bologna, Labics authored a new urban regeneration project in Rome. 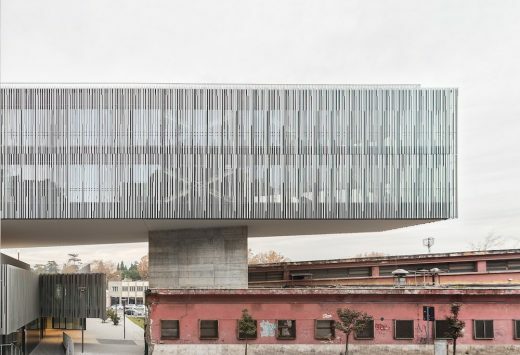 On a triangular lot of land, close to Tiburtina station, not far from the urban fabric of the established city and overlooking the Verano monumental cemetery, a building complex for a variety of uses has taken shape, arranged around public spaces that are augmented by a structure with several levels developed around a central square. City of Sun, the name of this project constructed following an invitation competition, highlights Labics’ ability to define innovative programs guided by profound knowledge of the historical city and the quality of its relationships. 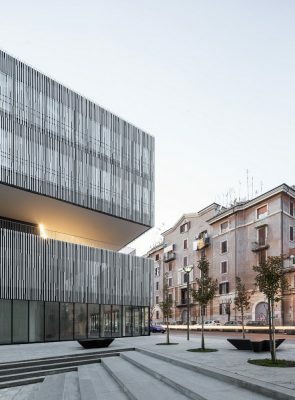 In an area covering 11,000 square meters in the eastern part of Rome, the architectural firm Labics has completed City of Sun, the project to regenerate a triangular lot of land situated between the modernized train station Tiburtina, the ICP (public housing) Tiburtino quarter, the Verano Monumental Cemetery and Piazzale delle Province. Winner of the invitation competition launched by the Municipality of Rome in 2007 as part of the actions undertaken by the capital’s administration to enhance some of the areas used as a depot by the local public transport company, the complex designed by the architects Maria Claudia Clemente and Francesco Isidori is made up of residences, commercial spaces, offices, car parks and a succession of public spaces, on various levels. 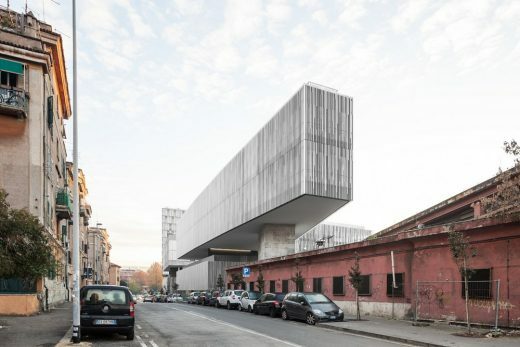 The project covers a patch of land previously occupied by the ATAC (the public bus company in Rome) depot. Built by Parsitalia Srl (as the general contractor), previously owned by Hines and now by Investire SGR, which manages it, City of Sun qualifies as an open project focused on sharing and interconnection with the dynamics of the neighborhood, located on the edge of the city centre. Conceived on the basis of a study of the geometries, the solids/voids relationship and a meticulous reading of the local identity, starting with the neighboring Tiburtino II quarter, the project puts public space at its core, developing a complex system of relationships between spaces and heights. The multifunctional program reflects this spatial arrangement, providing a commercial area at street level with office spaces above. On the façade, these latter are distinguished by a slight overhang and aluminium sunshades, made with commercial profiles pre-assembled into 4 different geometric combinations: the result is an effective composition and an original pattern. City of Sun offers two types of residences: “urban villas” and “tall houses.” The 8 urban villas, 100 and 160 square meters in size, are distributed over two floors plus a roof terrace and are designed as real single-family homes. They are found in the block occupying a central position on the lot of land. The tall houses, simplex accommodations of various sizes, are located in the tower volume east of the lot, with 9 levels above ground. They house 72 apartments ranging from 40 to 120 square meters. The loggias of these apartments vary in depth according to their orientation. 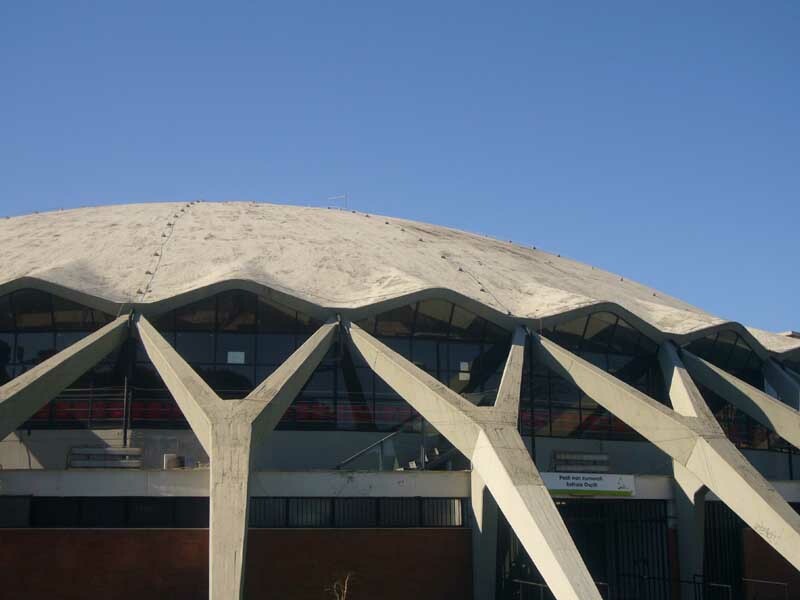 In the library (not yet built), located at the head of the triangular lot, Labics has chosen to keep the reinforced concrete shelter, now painted red, designed in 1937 by the engineer Mario Loreti, which over the decades has become an identity element for the neighborhood. The urban space evokes Roman archetypes and seeks hybrid solutions. In response to the requirements set out in the competition – relating to restrictions, among others, in terms of the height and alignment of buildings – Labics extended the dimension of the public space in addition to the most common typologies. With a declared interest in hybrid solutions and symbolically evoking Roman archetypes, such as the elevated squares of the Capitoline Hill or the Quirinale, City of Sun alternates communal areas on the ground floor with homologous solutions at higher levels. Through contemporary architecture tools, the complex is set up to accommodate re-appropriation processes of the urban dimension, encouraging users to fully discover the potential of this part of the city. In fact, even through the future library, City of Sun will be able to promote a process of relaunching the identity of the whole metropolitan scene in which it is located. The regeneration strategy originates from an analysis of the urban fabric. As the architects of Labics point out, “the most important aspects of an urban regeneration project are the relationship with the context and the creation of shared spaces capable of rooting the project in the local community.” This is the perspective in which the extended study of the local urban fabric, in large part twentieth-century, should be seen. In particular, the lot on which the competition focused falls within the immediate vicinity of the ICP Tiburtino II quarter, a low-cost residential complex dating back to 1926/1928 and organized in blocks, the work of Giorgio Guidi and Innocenzo Sabbatini. Moreover, the latter designer came up with the design of the building to which City of Sun ideally intends to pay homage with its name. The nearby House of the Sun, number 41-43 on Via della Lega Lombarda, represents a wellknown example of Roman residential building from the 1930s; it is characterized by a marked set of tiers: a device conceived to improve the lighting in the internal courtyard. Starting with these and other inputs, again connected to the analysis of the local urban fabric, Labics defined the positioning and evolution of the buildings. Both the constructed volumes and the voids are down to the intersection of the trajectories running through the neighborhood. This method should be understood as the compositional principle of the project and makes City of Sun an example of urban regeneration, of those currently underway in Rome, capable of encouraging expansion and, at the same time, the renewal of the historical centre. 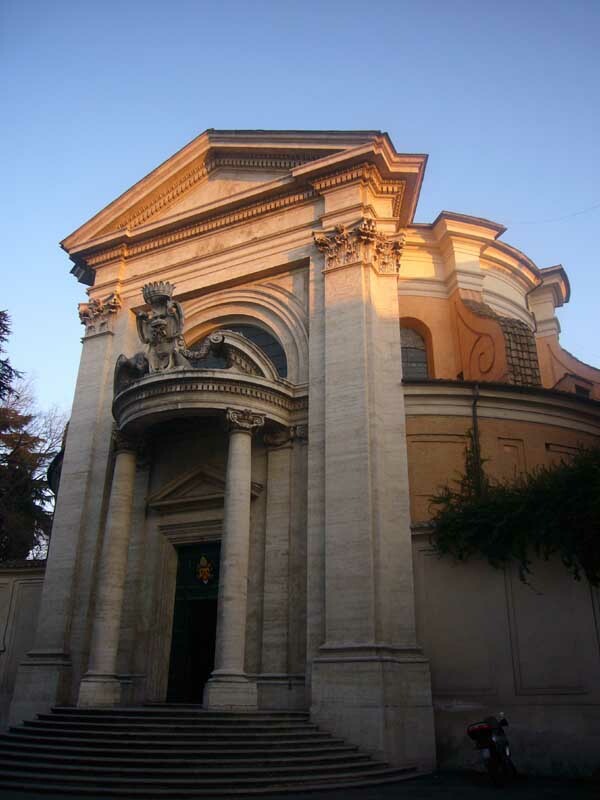 An epicentre of contemporary architecture in Rome. City of Sun is located in a part of the capital city which, over the last two decades, has undergone various renewal processes. In fact, if up until some time ago evidence of the most significant architectural renewal was represented by the iconic Post Office in Piazza Bologna, the work of Mario Ridolfi, the Tiburtina railway station by ABDR, the Roman headquarters of BNL BNP Paribas by 5+1AA and City of Sun itself contribute, although at different scales and according to distinct strategies, to the renewal of this specific area of the city of Rome. In particular, Labics intervened by indicating an original direction which is at the same time deeply rooted in the urban culture of the city.